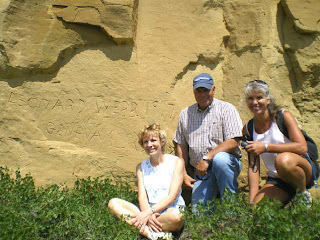 The other thing that points to why things preserve well out here is showcased in this graffiti carved into the sandstone wall behind our hosts’ home. Things don’t weather much here, and a love caught in sandstone almost a hundred years ago still remains. Look at this! 1917!! Can you believe it? 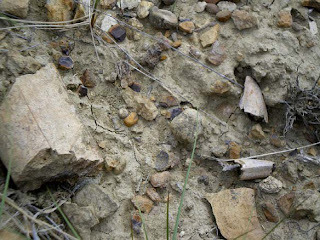 We were walking out some beautiful views in an area that our hosts had not prospected, when JoAnne came upon bone fragments. When I went to look, it was not just ANY bone, but a large chunk of what appeared to be the limb bone of a small theropod, and even better, TEETH! And they were definitely meat-eating teeth. Possible theropod bone, and DEFINITE theropod teeth! 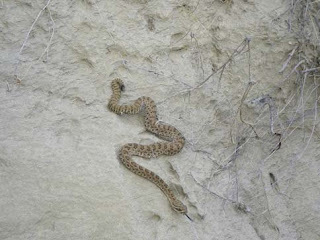 Just as we were digesting this find, Tim and Liz hollered from around the corner “BONE! We found BONE, and lots of it!” and then Megan rounded the corner, and she said “I think I found some BONE!” It was pretty exciting, and when we all got to comparing notes, it appeared that we had found a new site, with evidence of at least two dinosaurs! Look at the variety of different bones weathering out of this site! There was more and more bone, everywhere we looked. It definitely met Jack’s criteria for a quarry-able site, and our hosts, who had been told that the best material was gone, were pretty excited. In one area of the site, we found a lot of vertebrae coming down out of the hill. They were quite large, but it was impossible to tell from what we had what kind of dinosaur they were from. As I looked at them, I was surprised to see what appeared to be a small dinosaur, drawn on one of the vertebrae. 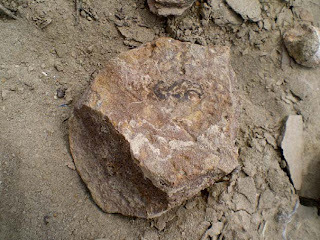 I thought that someone had gotten to the site before us and that this was some kind of practical joke, but closer inspection showed that it was a secondary mineral deposit on the bone. It is sure suggestive of a fat long necked dinosaur! Do you see the tiny dinosaur traced in mineral on this bone? 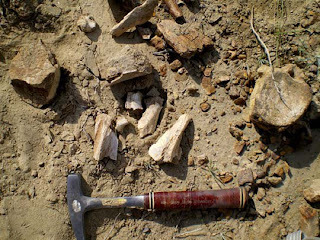 landowners, because when this well preserved bone is exposed to weathering, it doesn’t last long. I am not sure what they plan for the rest of the material, but as this is on private land, it is their call. Uncovering buried bone at the Madsen site, duly recorded by grad student Liz in her field notebook. Thus ends our longest stint in the field for this year, but I have one more short trip back to our area before I head back to NC. In the meantime, there surely is a lot to get done. I have such a great life! And it is a real treat for me to share some of that with my students, out here on the high prairies of the place I will always love and call home….despite the less pleasant wildlife we sometimes see! Enjoyed reading your blog. I'll be sending you an email soon, as I'm interested in your work and have a question about it - this is just so you can tell my email apart from spam - my last name is Venkatraman. 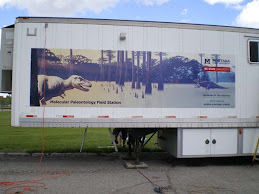 I love your blog and the mobile paleo lab!! Soooo cool!!! My name is Kyla Beguesse and I received your information from Dr. Varricchio. I have received funding for a research project and would like to know if you would like to be a collaborator on this project in the area of molecular paleontology. I already sent you an email with the research proposal attached for your viewing. Please let me know your thoughts and if you are interested. Thanks in advance for your time and happy digging!